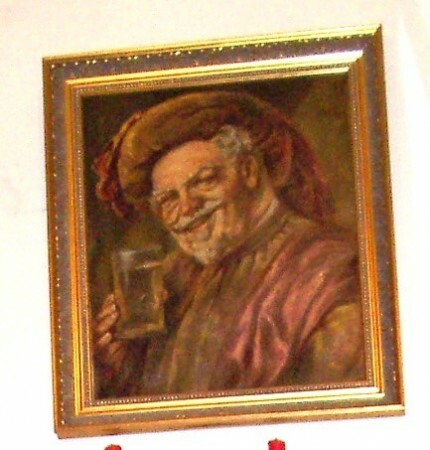 One of true beer drinkers’ heroes! 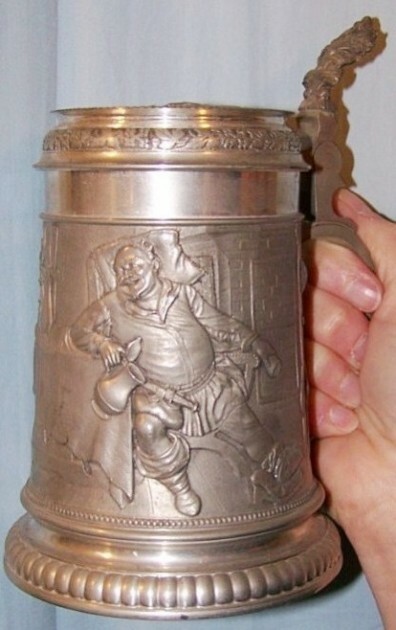 “Sir John Falstaff” with a pewter serving stein and glass beaker, most often shown in his hands. 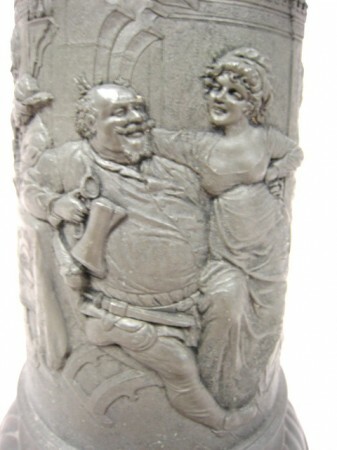 The old knight Falstaff with Miss Quickley, drinking from a German pewter beer server! 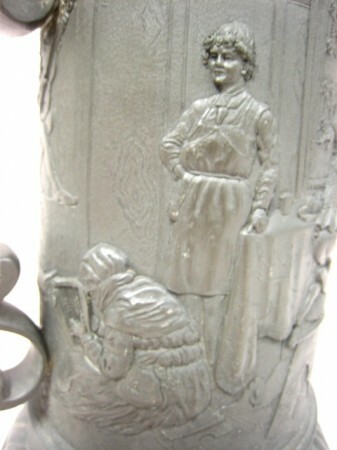 The same scene as shown on the print above, on a 1.5 liter pewter made stein by F & N, M.
Details of the great relief work on this stein. 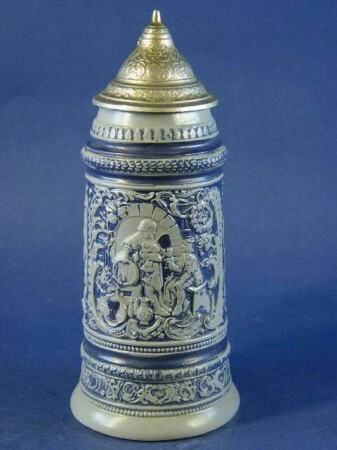 The same relief scene but on a taller beer server ▲, and on an oversized (1.5 liter) stein below▼. 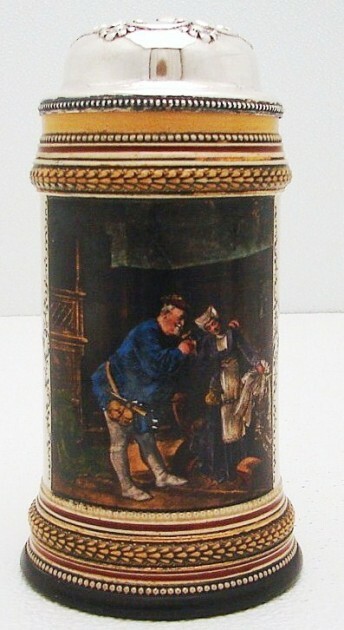 Both by F & N, M.
A hand painted scene of Sir John on a two liter stoneware stein Circa 1890. 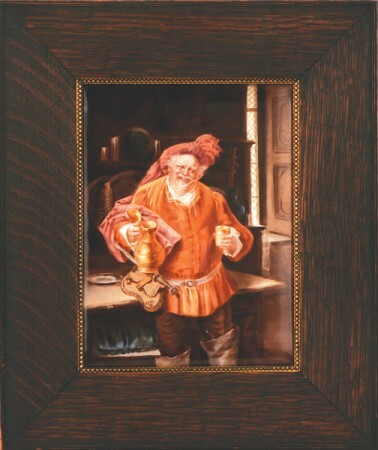 [TSACO] Notice the pewter renaissance flagon he is carrying. 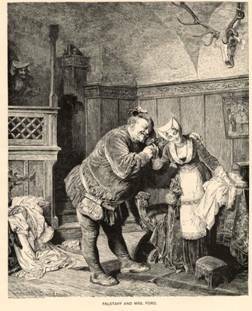 Two unknown artist’s versions of Sir John Falstaff with Mrs. Ford. 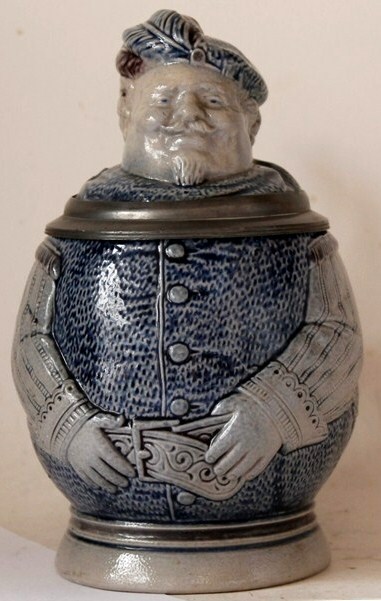 Sir John Falstaff is a fictional character who appears in three plays by William Shakespeare. Round and glorious, tradition holds that Shakespeare wrote the part for his second comedian, a fat man, John Heminges, who played a bold, bawdy humor of a John Candy sort. 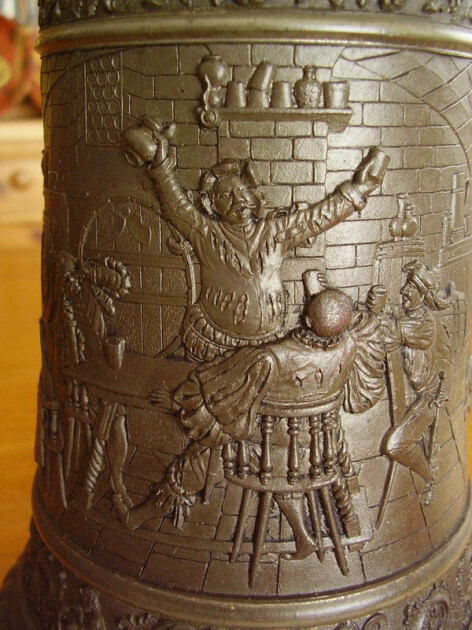 An alternative theory is that Falstaff was written for Will Kemp, the clown of Shakespeare’s company. The original actor was later succeeded by John Lowin, another portly comic actor. 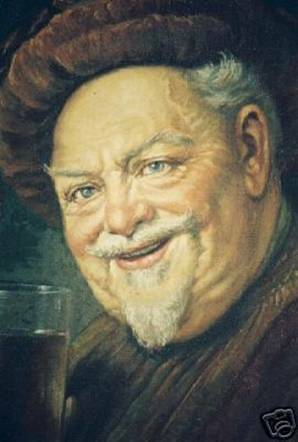 Flush with flatulent humor, Falstaff still managed to embody a kind of depth common to Shakespeare’s tricky comedy. 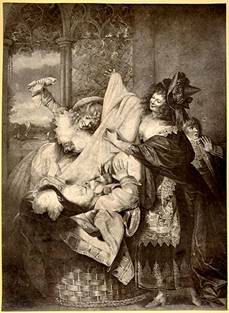 In Act II, Scene III of Henry V, his death is described by the character “Hostess”, possibly the bar-lady Mistress Quickly, who describes his body in terms that echo the death of Socrates. 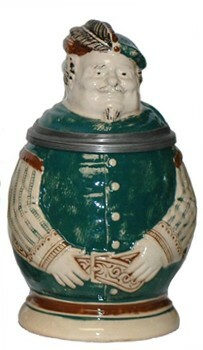 A V &B PUG Falstaff stein, No. 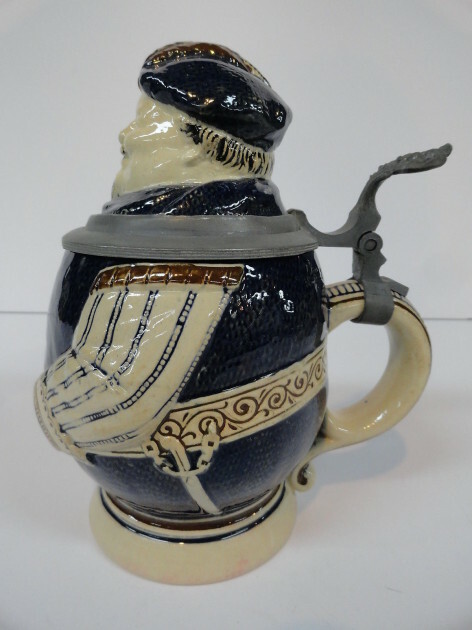 1909 (983), drinking from a boot! He is mentioned in Henry V but has no lines, nor is it directed that he appear on stage. However, many stage and film adaptations have seen it necessary to include Falstaff for the insight he provides into King Henry V’s character. The most notable examples in cinema are Laurence Olivier’s 1946 movie and Kenneth Branagh’s 1989 movie, both of which draw additional material from the Henry IV plays. Orson Welles’s “Chimes at Midnight (1966)” compiles the two Henry IV plays into a single, condensed storyline, while adding a handful of scenes from Richard II and Henry V. The movie, also known as Falstaff, features Welles himself in the title role. Falstaff (1893) is also the title of Giuseppe Verdi’s last opera, with a libretto by Arrigo Boito. It is mostly based upon The Merry Wives of Windsor Character. 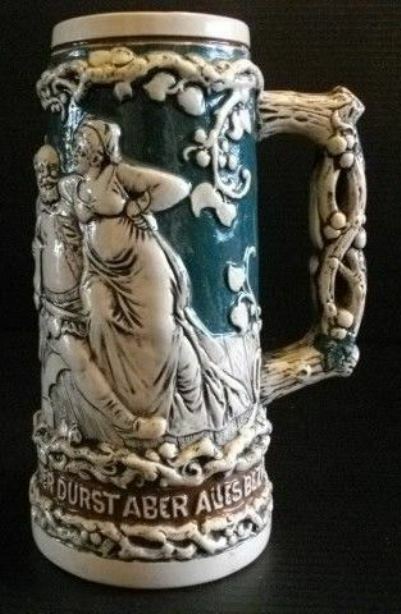 .5 liter pottery incised stein. Ca. 1885-95. Maker unknown. An unusual rendition. 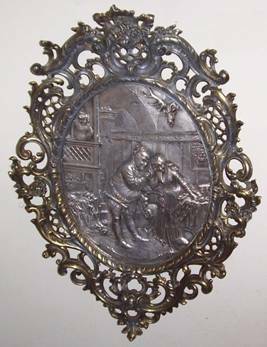 Painting on porcelain plaque. Marked T & W France, Limoges. 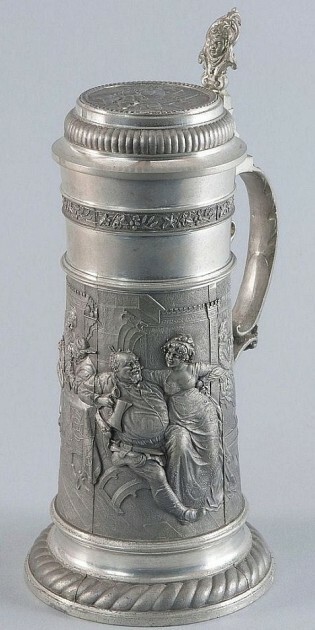 Notice Falstaff when seen drinking, almost always has either a pewter server or a glass beaker in his hands. 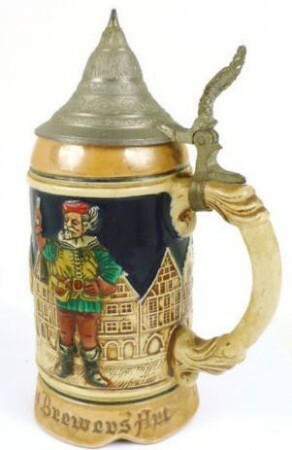 Here as above, he is shown with both a pewter stein and a beaker. 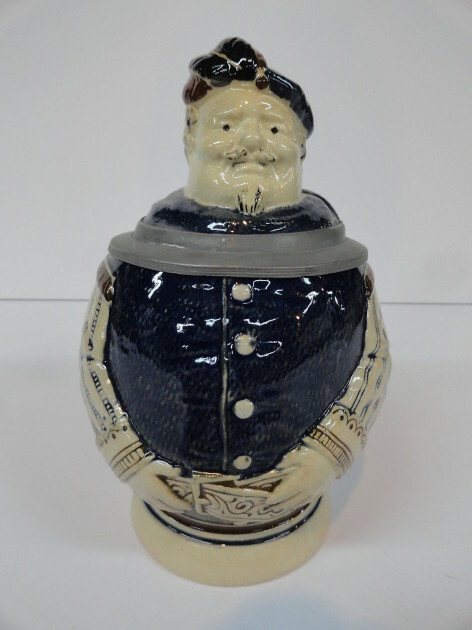 A 2.5 liter pottery relief stein of “The man.” Circa 1900. 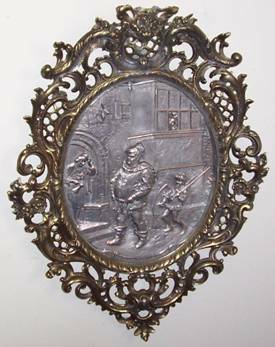 [RFA] Copied from the original oil, or a plaque such as just above. What makes portly Sir John so entertaining? How is it, when his actions would repulse many in both a modern and medieval context, we find ourselves so attracted to this lying lub of lard? Speculation over the years have produced many possible answers, one no more likely than the next. 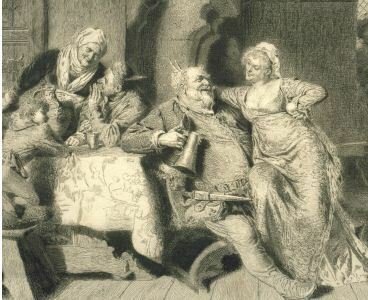 Whether or not the Queen of England truly requested “Merry Wives” for herself because she was so fond of the “huge hill of flesh” (Henry IV pt I, Hal, Tavern Scene), most do find some sort of affectionate connection. Possibly his openness in his crimes, his lack of loyalty being so apparent– essentially his frankness (not so much honesty) in life and his grinning self-determination and self observance. 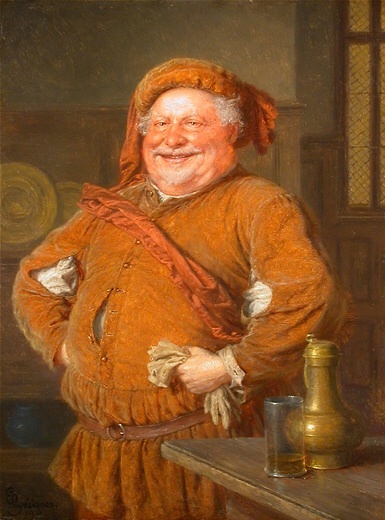 The character and deeds of Falstaff have very few similarities with those of his real-life eponyms. Shakespeare’s apparent desire to burlesque such heroes of early English Protestantism is one reason why some scholars believe he may have been a closet Catholic. 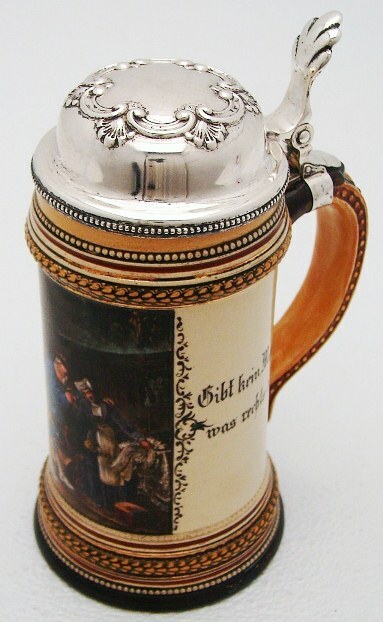 A very similar , but expanded scene to the one above – [probably copied the original art] showing the two drinking on a .5 liter pewter stein, dated 1890. 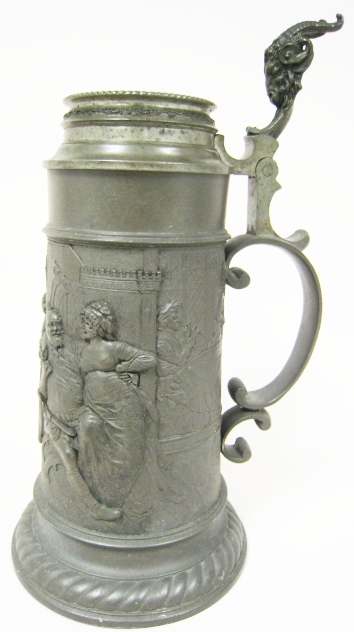 A newer version, re-issue, of the older (1900’s) cast pewter .5 liter stein shown above. 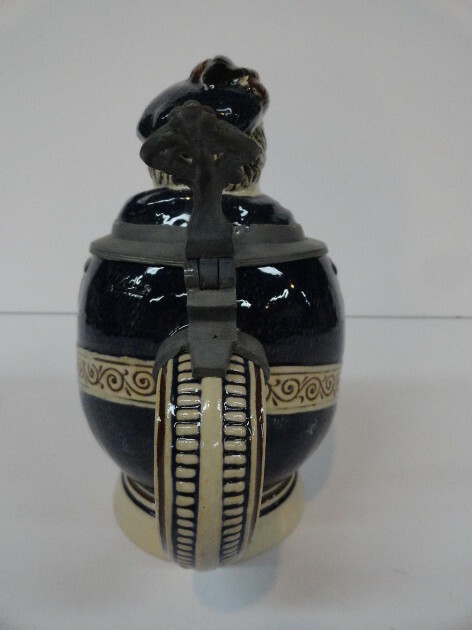 There is no oxidation or wear what-so-ever on this piece. 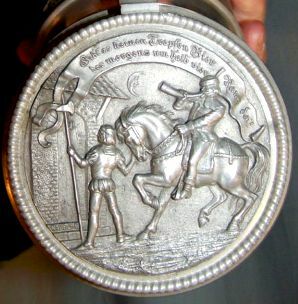 The relief pewter lid on the above. 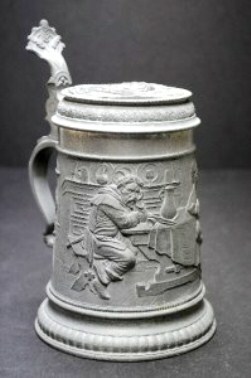 Another scene of Sir John that can be found on snother .5 liter pewter stein of the same vintage. 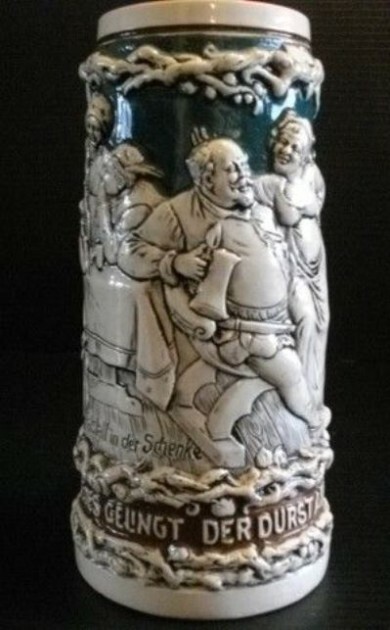 Falstaff on a .5 liter (what appears to be a Merkelbach and Wick) pottery, PUG stein. Circa 1890. 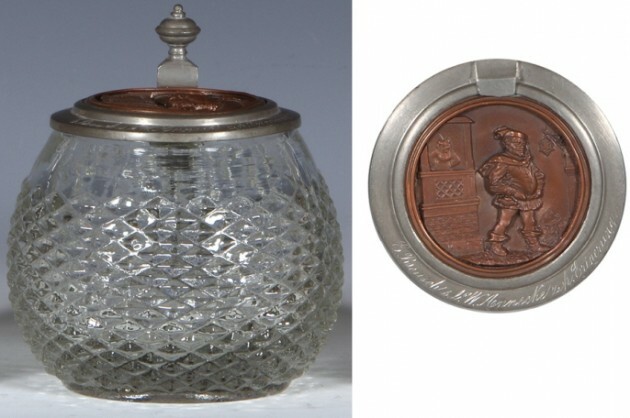 Detail of the silver lid. 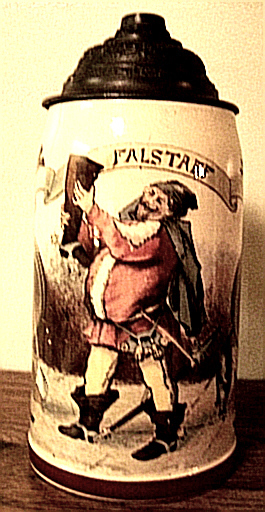 Falstaff by Merkelbach & Wick c.1890. 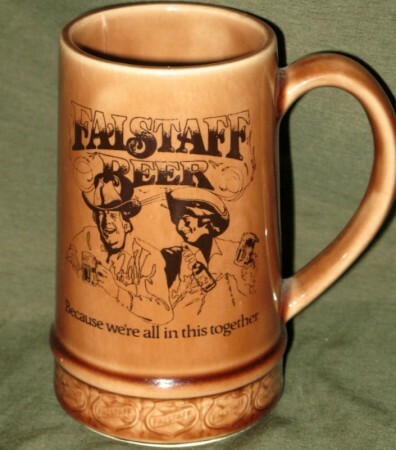 BELOW: Much NEWER Falstaff Brewing Company steins and other drinking vessels celebrating Sir. John . 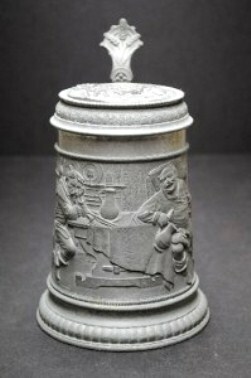 This .5 liter pottery relief stein came with a music box in the bottom. 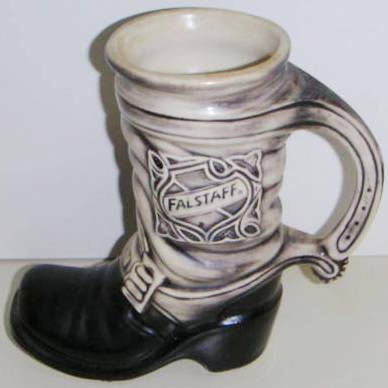 A Falstaff beer mug and a modern day version of the old drinking boot. 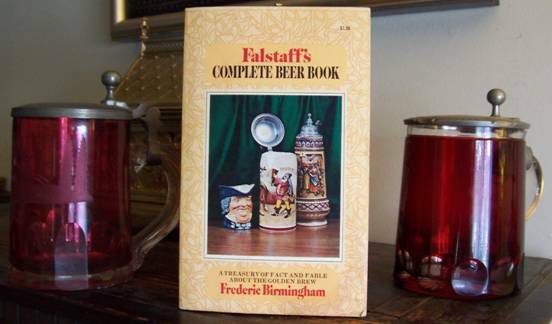 And speaking of Falstaff and beer! Another handy little paperback, published in 1970. 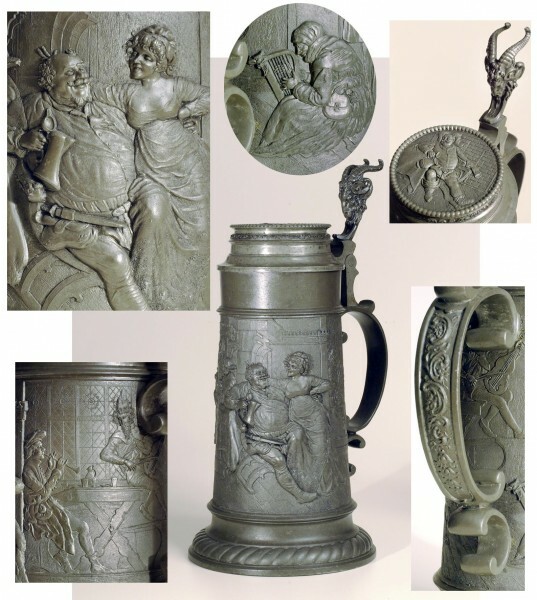 Lots of great info on beer, but not too much on steins within the eight color photos in the center. The Myth, Mystery and Meaning of beer. Your PH. B. of Beer – the Facts of the Case. All in all a splendid little addition to one’s reference library – but hard to locate, even on the net! Guy walks into a bar with jumper cables around his neck.